First, let me thank everyone for touching base to make sure that all was well at the Chronicles. I’m happy to say that it is. That, for the past six months, I’ve been taking a small break. I’ve been “unplugged” from everything: book, blog, twitter, FB and, yes, even email. And. although I may have been invisible, I haven’t been idle. I’ve been working on a screenplay. Here’s a quick peak at the fruits of my labors. It’s finished by the way — all 95 pages. And if you think writing a book is difficult, it’s nothing compared to writing a screenplay. The key to a screenplay according to the experts is show, don’t tell. It’s counter-intuitive to everything I’ve ever done as a journalist / writer / author. And now, after having met with my brilliant editor Melva McLean (who is herself a screenwriter), I am working hard on a rewrite. I am exactly where I was four years ago when I started writing Any Color but Beige —at the base of Everest, looking up. Of course if you think of it this way it’s a daunting task. So for now I’m just concentrating on the footpath in front of me. 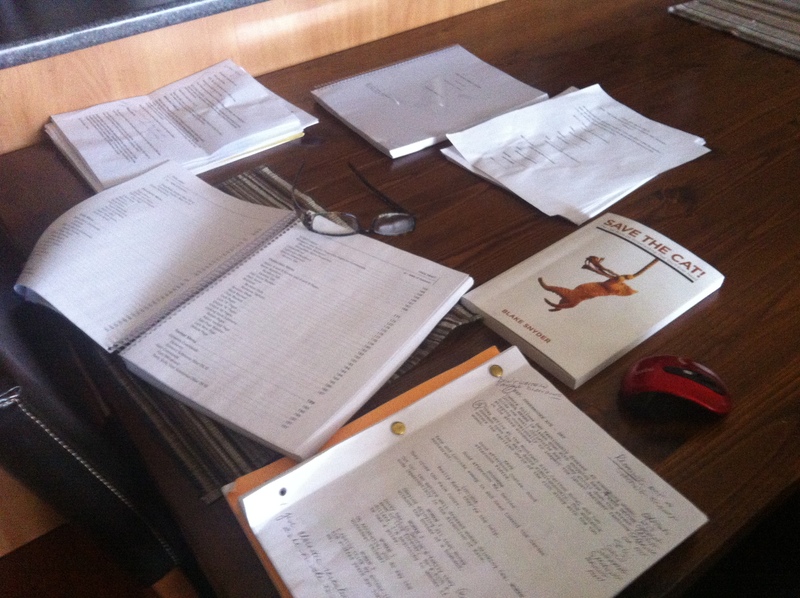 I have one simple goal – to finish the rewrite one scene at a time. If you’ve been following the Chronicles for the last three weeks you’ll know that I’ve been posting a free chapter a week for four weeks as part of an ongoing promotional campaign for my book Any Color but Beige. Over the last year, readership and subscriptions have increased dramatically. And I hope that by giving my new readers a preview of the book I can entice them to buy it, read it, and recommend it to their friends. The book is closely linked to my career as an international color marketing expert, so I structured the book according to my life’s personal color spectrum. The four colorful sections that make up the book are Primary Colors, Color Blind, True Colors, and Exotic Colors. Exotic Colors is this week’s section, from which I selected the chapter called Chapter 24 It deals with heartbreak and healing. And it was from this painful experience that my book Any Color but Beige came to be. My editor likes to say the best stories break your heart. And she’s right. If you’ve been following the Chronicles for the last two weeks you’ll know that I’ve been posting a free chapter a week for four weeks as part of an ongoing promotional campaign for my book Any Color but Beige. “True Colors,” this week’s free chapter, is all about rediscovering myself and adding color back into my life in ways I could never have imagined. This chapter gave me the ideas for book’s subtitle – Living Life in Color. Finally, in the last installment you will read all about the Exotic Color that was the genesis of this book. Get Your Second Free Color Sample Here! As I mentioned in last Tuesday’s post I am kicking off this year’s sales and marketing efforts by offering four free chapters (one a week) of Any Color but Beige to my blog readers. Over the last year, readership and subscriptions have increased dramatically. I hope that by giving my new readers a preview of the book I can entice them to buy it, read it, and recommend it to their friends. Last week, I offered a chapter from the Primary Colors section, and today it’s a chapter from Color Blind. Entitled “Bleeding Hearts,” it focuses on the wake-up call that made me take stock of my life, and then trade in all of the safe neutral tones that colored my existence for a more bold and daring personal palette. “True Colors,” next week’s free chapter, is all about rediscovering myself and adding color back into my life in ways I could never have imagined. This chapter gave me the book’s subtitle – Living Life in Color. lots of new experiences, including television interviews, coverage in major dailies, book signings, book club readings, but best of all was all the heartwarming feedback from readers who found a little bit of themselves in my book. It was also a very busy year because I managed all of the sales, marketing and public relations activities myself. 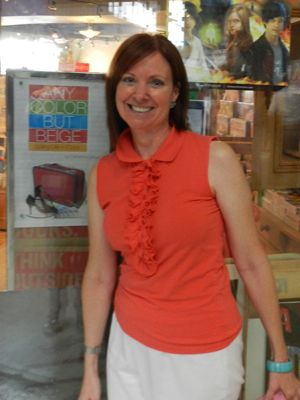 Maintaining awareness for the book and increasing sales was an ongoing full-time job. Between the book and my day job, I’ve been “Up in the Air.” more often George Clooney. So I am going to kick off this year’s sales and marketing efforts through the Café Girl Chronicles. Over the last year, readership and subscriptions have increased dramatically. I hope that by giving my new readers a preview of the book I can entice them to buy it, read it and recommend it to their friends. 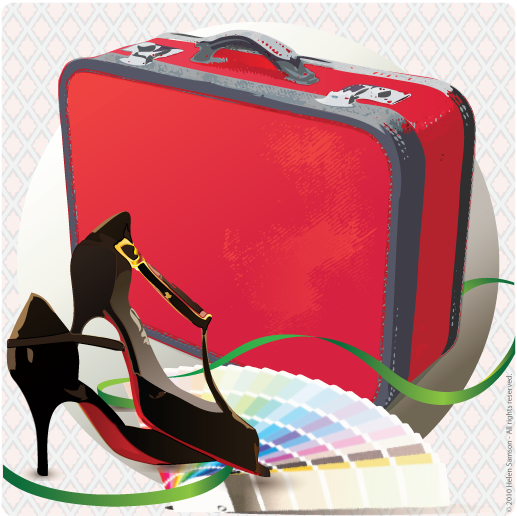 The book is closely linked to my career as an international color marketing expert. As such, I wrote the book according to my life’s personal color spectrum. The book itself is divided into four colorful sections: Primary Colors, Color Blind, True Colors and Exotic Colors. And so, for the next four consecutive Tuesdays, I will publish one chapter from each section. I hope to pique your curiosity enough to want to read more. Today, I’ll start with a chapter from Primary Colors, a section that focuses on my colorful childhood growing up in an Italian/Irish family. This chapter reveals the secret of the little red suitcase depicted on the book’s cover. The following Tuesday, Color Blind will feature a chapter on how easily we can lose sight of all of the color in our lives by playing it safe. The True Colors chapter in week three is all about rediscovering myself and adding color back into my life in ways I could never have imagined. This gave me the book’s subtitle – Living Life in Color. As you read in the previous post, sometimes I want to shake off those good girl shackles and be “bad,” if only for a little while. And the perfect opportunity seems to present itself once a year in the form a handsome Brazilian pilot who shows up at my door during the Montreal Formula One Grand Prix. For the past seven years the pilot and I have passed through a smattering of weekends of mostly style and no substance and very little sharing. 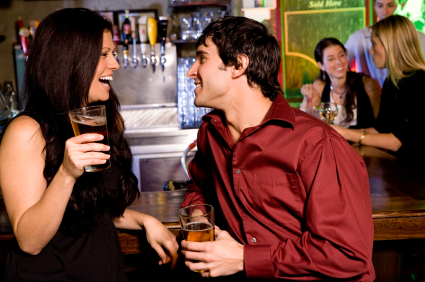 We as a couple seem to be stuck in a moment – the moment we first met. Shallow you think? Absolutely. On the other hand there is no danger of drowning in something more profound, in a sea of those roiling emotions that framed our first summer together as friends and lovers. Now it’s safer for us to tread water in the shallow end of the sea of love. It’s less scary for him (he can’t swim) and less frustrating for me (forever throwing a lifeline to a drowning man). But it’s the capacity to accept our relationship limitations that keeps us friends. We have an unspoken agreement that lets us honor the past without burdening the future with expectations. That agreement keeps us in contact throughout the year and enables us to share travel schedules in the hopes that someday our paths would cross on a bit more regular basis. But they never do. When I’m in Paris he’s in Palm Springs, when I’m in Beijing he’s in Barcelona – even with all that international travel our paths only cross here, in Montreal. I don’t think it coincidental at all that Michael Buble’s song “Home” hit the top of the charts the year the pilot and I met. It defined us then and it defines us now. It’s the stay/go paradox we both share. And I know that when he turns up at my door with a box of dark chocolate covered strawberries and good Grand Cru like he did last weekend he finally feels at home and so do I…if only for a little while. During the course of my promotional year for my book, Any Color but Beige, (I’m nearly three quarters of the way through now), I’ve been invited to speak to a lot of book clubs. And of all of my promotional activities, apart from my book launch, this has been the most fun. Media interviews are sometimes nerve racking. Public speaking can be a bit impersonal because of the distance between me and my audience. Book signings can be a little intimidating; you sit front and center in a bookstore waiting for your reading public to arrive and snap up your book. But participating in a book club discussion is like having a night out with a whole new set of (café) girlfriends. And because they don’t know me I’m always surprised by the type of comments, questions and suggestions. How does one sound tall, I wondered? And, how else do I sound? She was right on both accounts. She had even remarked to her boss that this is what she had expected Cat Larose to look like. It’s no wonder he had a bit of a startled expression on his face when we met; it was like he already knew me. My dentist’s receptionist surprised me one day as she assigned me a very “professional” attitude. After ten years of biannual appointments and polite banter, I finally mentioned what I do for a living during my last visit. She stared at me wide-eyed. And then she said, “You know, I always thought you were a doctor!” I love these kinds of comments because they make me laugh – at myself. And it’s so important not to take yourself or life so seriously all the time. Many of comments about the book make me laugh too, but all are very gratifying. I’d like to share some of them here with you. It made me reflect on my own life, my own writing, and where I’m coming from. You have the power to connect with your readers, you can touch people…even change the life of your readers…that is something really special. • It’s easier to let go of something you don’t want to keep. • It’s about how you feel and not about how someone else makes you feel. • The only man worth crying over was a dead one. That’s a real loss. Anything else is a blessing. • I want to be deliberate in your life. I love the way you write and I enjoyed hearing your voice as I read it. It was a fast read because I just didn’t want to put it down and on the flip side, I didn’t want it to end. Thanks for sharing your adventures and hilarious experiences with all of us. It was so much fun to read a happy book. I’m really proud of you for having the courage, gumption and commitment to share your life. 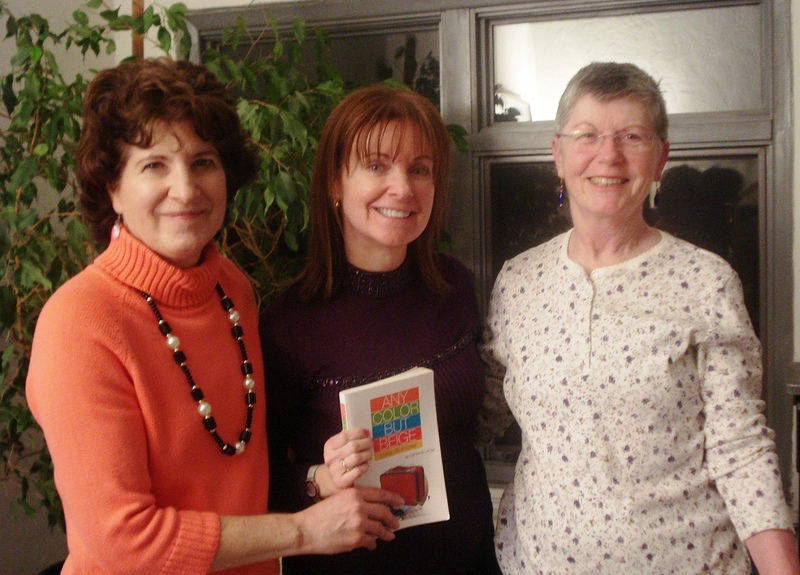 At my hometown book club gathering with Freya (left) and Kathy (right). You now know the answer to the first question, and that answer is yes. It’s time to try something new. The answer to the second question is not so easy and so I throw it back at my readers. Who do you think could capture the essence of Cat? Book club readers have told me they’d like to see a second book involving lots of travel and of course a little romance. All I can say to that is if my recent travel schedule is any indication: Germany, Holland, France and South Africa – I’m well on my way to collecting lots more new travel stories. As for the romance, we’ll just have to wait and see.